In the 'Big Four' accountancy investigations, can independent regulators bite the hand on which central government feeds? KPMG, and the other big 4 accountancy firms are accused of contributing to the Carillion and BHS scandals. Image: KPMG London office. Håkan Dahlström Photography via Flikr. Some rights reserved/CC0. 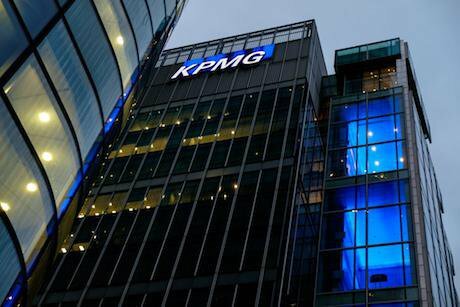 The ‘Big Four’ accountants - an oligopoly if ever there was one as Bill Michael of KPMG has freely admitted - are charged with lowballing statutory audit services to major companies in the UK in order to gain much more lucrative advisory work. As a result (it is said) the audit work is done poorly and this has contributed to the series of scandals such as Carillion and BHS. What is more, it is also said that the 'Big Four' have little incentive to give the sometimes necessary bad news to their client (and therefore the market) for fear of losing the tasty advisory work for which the statutory audit has provided such an unappetising entrée. So unattractive is it to be a player in the statutory audit market for FTSE 350 companies that a fringe competitor to the 'Big Four' (Grant Thornton) has actually pulled out of it recently citing the impossibility of making it pay. Unsurprisingly in these circumstances the government has now taken action and the Competition and Markets Authority (CMA) will revisit this classic case of market failure for which it failed to come up with any effective remedies but five years ago. With the much criticised Financial Conduct Authority (FCA) also carrying out a separate investigation on the regulatory side, it is fair to say the 'Big Four' are getting serious attention from regulatory authorities. Clearly, there is a genuine public interest in making sure that audit work is done well and results in good advice to shareholders (and the market). But lurking beneath the surface is the concern that the relationship between central government and the 'Big 4' is too close to be healthy as government spends millions on their non audit services annually. So what chance is there of any serious structural remedies emanating from the CMA? Can independent regulators really bite the hand on which the government feeds? At least the chances of serious remedies being proposed have increased because in its new consultation document, the CMA is going to look at the issues holistically by turning the spotlight on what they call “non audit services” – basically the advisory services that are the 'Big Four’s' main course. So far as it goes, this focus is well overdue. Lawyers, on the face of it have every interest in the non–audit services enquiry being searching. For many years the profession has watched whole areas of work disappear as a result (it is said) of accountants leveraging their monopoly in audit services to enter and dominate more lucrative advisory markets. For example, one would have thought that VAT advice - a highly technical legal area where EU law, badly draft Statutes, inaccurate HMRC Guidance and decisions of the Tribunals and courts interact uneasily - would be a fertile ground for lawyers. But one would be wrong; for it is a minefield which accountants - and particularly the 'Big Four' - dominate. The legal profession for one would be very happy if the playing field were to be levelled a bit. This might actually happen one day because the CMA is considering prohibiting audit firms offering non-audit services not only to their audit clients but also to any other large company. Even more radically, the CMA is (somewhat nervously) considering splitting the UK arms of major accounting firms into audit only and non-audit services practices. In identifying these remedies as potential cures for the conflict of interest arising from the provision of non-audit services to audit clients by the ‘Big 4’, there is an implicit recognition that the European Court of Justice’s bald pronouncement (in other contexts) that conflicts of interest are "inherently anti competitive” is correct. This is strong stuff. Unfortunately, the UK competition authorities have not really recovered from their rather unsuccessful re–structuring of the beer industry a couple of decades ago. They talk the talk about the need for structural remedies in their published material but action may prove difficult. For one thing, serious remedies can have unintended consequences and the CMA is alive to this and itemises a number of downsides to its proposals. One consequence that they do not mention is that unless and until restrained by new entry, audit costs charged by the 'Big Four' may rise as the cross subsidy from non-audit serve revenues are squeezed. Something comparable happened in banking where regulatory action to reduce extortionate overdraft fees is exerting pressure on banks to reduce 'free' banking. Rising audit costs will not be popular with FTSE 350 corporate customers – though they could always sponsor new entry or try to get Grant Thornton back. For the legal profession there may be other consequences. Any comfort that a level playing field might assist them to re-conquer advisory markets that they have lost to accountants is likely to be short lived. For the 'Big Four' are unlikely to take any loss of advisory service revenues lying down and may enter the legal market in a really serious and determined way. For the regulators, the consequences of appearing weak yet again will be worrying and for the FCA potentially catastrophic. PWC’s much criticised role in assisting OFWAT in its 5 year review of water industry pricing, whilst at the same time advising water companies, is of course not being replicated by the CMA and the FCA in their current enquiries but the unacceptable face of corporatism is on show for all to see whilst the government continues to spend so heavily with the 'Big Four'.